Cracks are caused by movement, or lack of cover in concrete, stonework and brickwork. The exact technique of dealing with each repair will vary according to the particular features of the job and the structural problem to overcome. Under particular circumstances, many other methods of injection or application may be appropriate. For bonding hollow floor screeds and toppings the resin may be injected through a series of 6 mm holes drilled through the screed or topping, or application may be made by gravity feed through these holes. A ‘ponding’ method is often convenient, using a putty or All Purpose mastic to form a ‘reservoir’. 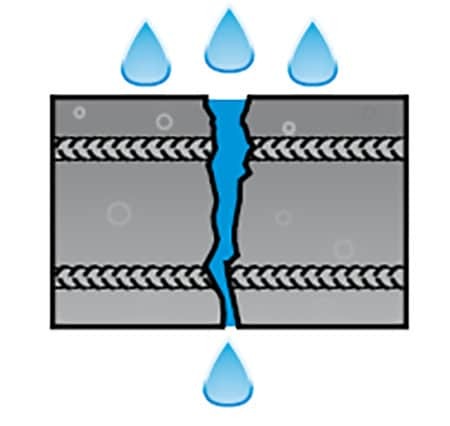 Grades used by Cemplas are either a very low viscosity resin for the finest of hairline cracks. The cure rate of this grade is retarded to permit time for injection into narrow cracks. 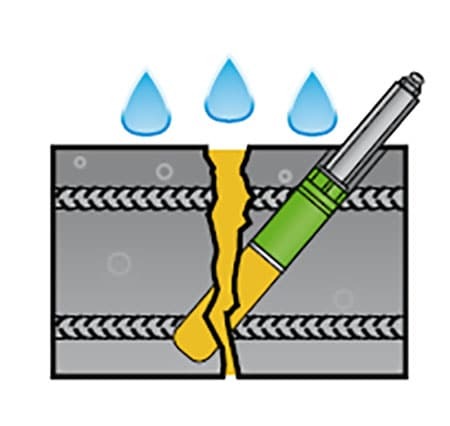 A low viscosity but thixotropic liquid for cracks from 500 micron to 4mm. The thixotropic nature of this resin ensures that the injected resin will not drain from the injection point / area of the crack before it has initially cured, but it is sufficiently low in viscosity to be injected into these quite narrow cracks. Resin Injection systems have been specifically developed to make structural repairs that will restore (and under many circumstances improve) the concrete, brickwork or stonework to its original strength and condition. A heavier bodied resin for gaps and cracks wider than approx 4 mm and with the thixotropic benefits of above. Resin Injection can also eliminate further damage that is likely to be caused by the passage or leakage of water and will effectively repair concrete, stonework, and brickwork without leaving unsightly surface marks and ensure a more rapid, and economical repair.